In Friday’s post, I talked about affordable finds from the 2018 Nordstrom Anniversary Sale, which is currently open to cardholders and will be open to the public THIS Friday. 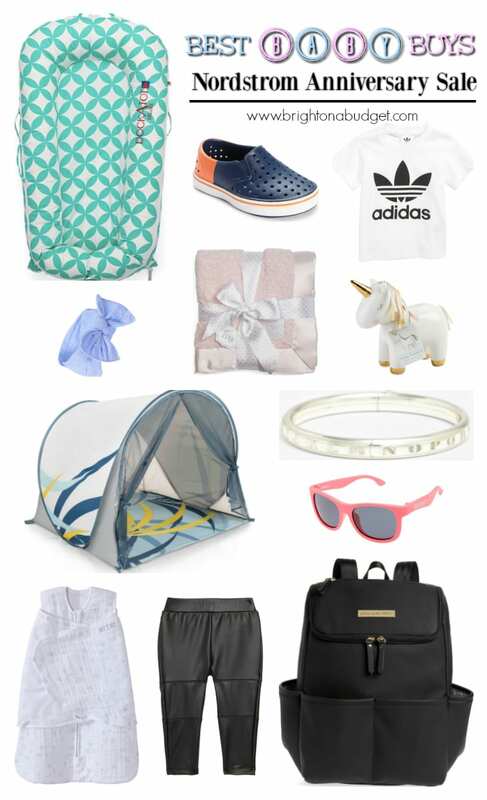 Today I’m sharing what are, in my opinion, the best baby buys from the 2018 Nordstrom Anniversary Sale. I shop a lot at BuyBuy Baby now that Babies ‘R Us is closed, so I compared these deals to the typical 20% off coupon I use at BBB. DockATot Deluxe Stage 1 Dock: sale $137.90, after sale $185. So many moms swear by this product, and this is a great deal! Native Shoes Miles Colorblock Slip-On Sneaker: sale $25.90-$29.90, after sale $40-45. This is another item I see recommended by moms time after time. adidas Originals Trefoil Logo Tee: sale $12.90, after sale $20. I bought this for Karoline–super cute! Baby Bling Headband: sale $7.90 or 3 for $20, after sale $10 each. I love these bows for Karoline, and they’re typically $10 each. This is such a great deal for baby girls! They also fit her in the hospital. Nordstrom Baby Luxe Chenille Blanket: sale $29.90, after sale $49. I love the blankets from Nordstrom Baby. They’re so soft and look awesome in pics. This comes in 3 colors and would make a nice baby shower gift! Baby Aspen Ceramic Unicorn Bank: sale $25.90, after sale $40. How cute is this?! Perfect shower gift for a baby girl. Babymoov Anti-UV Tent: sale $35.90, after sale $39.99. We used a similar tent at the beach, and it came in very handy. Sterling Silver Alphabet Bracelet (infant): sale $35.90, after sale $55. I bought this for Karoline before she was born and took it to the hospital with us. It’s such a beautiful keepsake piece! Babiators Original Navigators Sunglasses: sale $12.90, after sale $20. I bought a pair of these for Karoline at full price and lost them before we made it to the beach:( I’m glad I was able to score a second pair on sale! These come in both pink and blue. Halo Platinum Series SleepSack Quilted Swaddle: sale $25.90, after sale $39.99. I’m all about safe sleep habits, and we used a Halo swaddle for Karoline until she was able to roll over from her back to her belly (about 3-3.5 months). Halo Platinum Series SleepSack Quilted Muslin Wearable Blanket (not pictured): sale $25.90, after sale $39.99. I’m looking for some of these for Karoline for this winter. Petunia Picklebottom Bottom Method Diaper Backpack: sale $105.90, after sale $159. Such a good deal if you’re looking for a PPB backpack diaper bag!